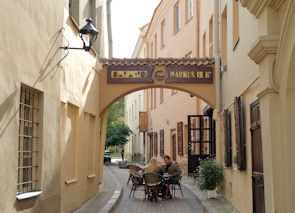 neighbourhood of the quaint Vilnius Old Town area. As John and I were strolling along the pleasant Stikliu Street, a table tucked away in the cobblestone courtyard caught our eye. The couple sitting there were obviously enjoying themselves and we decided to give this restaurant a go. It is small and cosy and once inside there is a warm glow of refined décor, which is easy on the eyes and offers a calming atmosphere. Casually dressed, very friendly staff makes the place laid back and welcoming. Markus and KO is a Lithuanian-American restaurant. John and I agreed that the place has an expensive London pub feel to it with dim lighting, mahogany furniture, dark wood bar and a piano in the corner, which adds to the ambiance. The restaurants sizeable bar provides a pleasant place to have a drink. 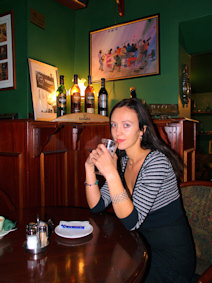 They offer a big choice of well-selected wines, whiskies and beer. Markus and KO also has basement dining rooms downstairs, decorated in two different themes. One of them is painted in soft pink and yellow colours and has black-and-white Marilyn Monroe pictures on the wall, which is atmospheric for a romantic dinner. A maritime theme dominates in the other with a fish tank and comfortable leather sofas. Markus and KO is one of Vilnius restaurants that have an excellent reputation for high quality steaks therefore John went for Markus famous fillet mignon steak (medium size) (14 €). I didn't try it, but he assured me the taste and texture was spot on. I went for roasted turkey breast in cranberry and red wine sauce at 13 €, which was delicious and had a right mixture of flavours. They also have a number of fish dishes and seafood on the menu. We finished off with a desert of cherries poached in wine sauce with ice cream (5 €) Which worked perfect as a combination and tasted nothing short of sublime. The service was slick and professional and the waiter was happy to accommodate all our wishes. We had an overall pleasant experience and will return back.